Unilever PLC's new CEO Alan Jope has an ambitious plan: to turn the 90-year-old consumer goods stalwart into a fleet-footed, digital giant. The company is using data to engender a soup-to-nuts transformation that appears to be well ahead of similar efforts undertaken by many of its peers. The plan touches key areas of Unilever's operations: many of its 2.5 billion daily customers; its 161,000 employees; its 400-plus household brands; and the 300 production facilities it operates across 190 different countries. It is a model in which AI systems predict demand better than old-school calculations, new brands are co-created with consumers, and customers are precisely targeted only with products they want on phones and other devices. "It's about digitizing all of the aspects of Unilever's business so that we can leverage the world of data and increase our digital capability in everything we do," said Jope in a presentation to investors and analysts in December 2018 in Mumbai. 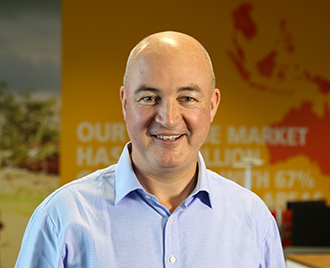 "The change is palpable" across Unilever, said Andy Hill, global vice president for information and analytics, in an interview with S&P Global Market Intelligence. By 2025, consumers will be connected via 20 billion digital devices, nearly three times the global population, according to a report by consultancy McKinsey. Just about every big company says it has a far-reaching digital strategy, but that can be a risky boast: the research suggests that 70% of all digital transformation plans fail. The incumbents that succeed, though, can reap rich dividends. "We found that the three-year revenue growth (of over 12%) for the fleetest was nearly twice that of companies playing it safe," McKinsey said. It is unclear if Unilever will be one of those successful incumbents, but the Anglo-Dutch company is off to a brisk start. The digital shift began under former CEO Paul Polman, who ran Unilever for a decade before handing the reins to Alan Jope on Jan. 1. The push toward digital is partly to overcome several serious market challenges faced by all consumer goods companies, including anemic growth in the food business, the effect of weak currencies in emerging markets (where Unilever derives 60% of its revenue) and the pressure to attract finicky millennials who live by Facebook Inc., Twitter Inc. and YouTube instead of print, radio and TV. Jope has earned his digital chops. Before becoming CEO, he was president of Unilever's beauty and personal care division and championed new digital techniques to woo customers to Dove soap and Axe shower gel. In 2016, he led the $1 billion acquisition of Dollar Shave Club, which uses viral marketing and a subscription model to deliver razors and grooming products directly to customers' doors. Jope also oversaw the founding of a "digital disruption center" in Manhattan that pitches dozens of products through online channels, one of which is Skinsei, a skincare regimen that uses a digital app to tailor products to a customer's diet, sleep and exercise patterns. "Unilever's digital marketing is ahead of Nestlé SA and Reckitt Benckiser Group PLC," said Martin Deboo, analyst at Jefferies, in an interview. "This is one of the areas where Jope is going to set out his stall." While the traditional approach is to buy customer data from a market research firm like Nielsen's, Unilever is rapidly building its own database using online customer registrations, third-party sites that consumers visit and data from store loyalty cards. It has amassed 900 million individual customer records so far, up from 200 million a year ago. Of those, 750 million are anonymized numbers for phones and other devices; the rest are customers' names, addresses and consumption patterns. In less than a year it collected 37 million personal records of Thai consumers, along with the consent and approval to engage with them. That is roughly half the population of Thailand. Unilever says it adheres to the EU's new GDPR data-protection standard in Europe and all other countries. Large-scale data can be a marketer's dream. To pitch Baby Dove in India, Unilever first assembled data on homes that were known to buy infant products, then used that data to create a much larger "look-alike" audience on Facebook. It delivered Baby Dove messages directly to those accounts. It did the same thing on YouTube, and found the overall results to be promising. Typically, for such a product, Unilever in India spends €500,000 monthly on TV and digital marketing. The new method cost just €100,000 per month and yielded a bigger jump in brand awareness and other measures. Big data can help bring products to market faster. Unilever says it has launched 10 new brands in 2018 and that such launches are 40%-50% quicker than they used to be. In November, Jope's team introduced a product called Purifi in China, which claims to protect the skin from pollution. The brand, born entirely out of data, was co-created with Alibaba Group Holding Ltd. Unilever used the Chinese company's e-commerce platform to get real-time feedback and consumer insights to design and develop the product. Within seven months, it was launched on Alibaba. "We used to think in years, quarters, months. As soon as you start digitizing your company, you start thinking in quarters, months and weeks," said Peter Ter Kulve, the company's chief digital officer. "Speed is of the utmost importance." In December 2017, Unilever acquired Schmidt's Naturals, a small Portland, Ore., company known for deodorants. Product development there was driven not by management, but consumers: When fans demanded more product lines, Schmidt's took note and launched a toothpaste. "Schmidt's has been built entirely using data-driven marketing, hardly any conventional above-the-line spend. And that learning has been used to scale our mass consumer brands," Jope said. Not every idea works. Of 200 data-driven products explored by Unilever, half were killed. Of those that survived, 20% have been launched so far, the company says. The heart of Unilever's data-driven marketing is the "digital hub," a physical table where a group of people sit and work in real time, seeking out new customers for the company's products. These analysts study the data for consumer traits, segment them, then scale it across an entire country. It's a big task: The Thailand data, for example, breaks down into 240 segments. Some members of the team create content, others send the content to consumers, another person monitors the performance of the overall exercise. One expert is on hand to ensure that data-privacy rules are followed. "This is probably the one big game-changing thing that we've deployed," said Stan Sthanunathan, an executive vice president at Unilever, during his presentation in Mumbai. "It's an end-to-end team that brings the digital hub to life." Unilever operates 11 digital hubs today. It plans to expand to 24 countries by 2020 and across all markets by 2021. Like most companies, Unilever uses a mix of traditional statistics and market knowledge to forecast demand for its myriad products in myriad markets. It is hard to do because so many factors are at play, whether it be the recent level of advertising spending, a rival's new promotion, or even weather and traffic conditions. That is why demand forecasts are at best only 70%-80% accurate, and often much lower. As part of its digital push, Unilever in the past year has tested a new AI system to predict demand. A forecast that was 70% accurate under the old method was now 74% accurate. "We create 40-45 billion pieces each year in India alone, so what looks like a small improvement has a huge impact on our profitability," said Hill. Unilever employs 1,250 people who specialize in digital technology and plans to hire another 10,000 over the next two years. It has also embarked on a massive training program to get current employees up to speed on digital skills, including 5,000 marketeers; 5,000 planning staff; supply chain personnel; and those who work in factories, robotics and automation. If executed well, the digital transformation of Unilever will be "a growth and margin expansion story," said Ter Kulve. "It is 70% about people, culture and ways of working, and only 30% about technology."